More like Grindsia, am I right? The greyification in modern gaming marked by big guns and small color pallets has led to many indie developers reaching into gaming’s past to diversify digital game shelves. To this effect, we’ve seen both the console and handheld marketplaces flooded with retro-styled pixel platformers and shoot-em-ups, and now Kemco, along with prolific 3DS eShop publisher Nicalis, has brought us a new ‘90s RPG to add to the mix. As a game that makes no bones about its 16-bit inspirations, the question is just how well Grinsia holds up to its legendary forerunners. It’s clear from the game’s title screen and opening scene that it exists very much in the vein of Square-Enix games of yore. Where many retro throwback games pick up the visuals of yesteryear with modern gameplay touches, Grinsia goes full 1990. Think Final Fantasy before it adopted the Active Time Battle system (II and III are prime examples) and you’re on the right track. So if the idea of classical RPG gameplay doesn’t excite you, read no further. Wow, Grinsia. What great... "dialogues" you have there. Yes. Wonderful set of *ahem* "words." The game’s story focuses on a family of treasure hunters with the son of the father-daughter-son trio acting as the protagonist. Though not entirely borrowed, the tale never strays too far from established genre clichés. The first few hours of the game, for instance, will see the family discover that the technologically advanced empire reigning over the land is not as benign as it wants you to think, discover that the goddesses and relics of legend actually exist, and join with a band of pirates to cross an ocean that’s suddenly become more hazardous due to the unexplained resurgence of monsters. If any of this sounds familiar, it’s because you’ve played an RPG before and it won’t be the last time the game blurs the line between nostalgia and déjà vu. This has its upsides, making the game enjoyable on an academic level and familiar for those who haven’t replayed any of their old RPGs in recent years. It also makes for an interesting metagame of sorts to recall from whence the Grinsia’s numerous clichés originate. Most, however, will be left wishing they saw a few more original ideas during their 30-ish hours with the game. While the game's overall art direction is perhaps its most redeeming quality, high levels of detailing don't make the dungeons any easier to navigate. So if the story’s nothing new, what about the gameplay? Unfortunately, much of the same can be said. Expect to spend a considerable portion of your time grinding for experience and gold, traveling around a lifeless overworld to reach the next town/dungeon/plot point, and wandering back and forth through labyrinthine caves hoping to find a boss or an exit and praying that you have enough health left when that boss finally shows. Each character has unique stat preferences and skills that distinguish them slightly in terms of strength, speed, defense, or magic proficiency, but the stat differences are never too far apart and most of the skills overlap with other characters so none ever feel too fresh. A positioning system also comes into play, adding some strategy in determining how your party will line up for battle. Naturally, those on the front line will be bigger targets for enemies while those on the back are safer. This is nothing new, but Grinsia does take this mechanic a step further by limiting the distance from which enemiec can be targeted by all but ranged fighters, making the front vs back row decision a little more meaningful. Also interesting is an “EX Skill” system where characters equipping one of the game’s legendary relics can perform an especially powerful attack or boost after filling the EX gauge. This super move, however, feels underutilized. Because the meter takes so long to fill, you’ll never feel comfortable firing off the skill against anyone but bosses, and, since bosses can sometimes appear by surprise, you may find yourself grinding after each boss fight just to charge your super moves in case another one comes along. With a much quicker charge, this could have been an interesting mechanic that dominated battles and gave Grinsia’s combat a more original feel, but as it stands, it’s a miniscule change to the tired turn-based battle formula. Enemies, characters and battle effects all feature attractive colors, impressive detailing, and smooth animations in a pixelated style, making for a visual experience as good as your favorite Fantasy, Quest, or Tale from years gone by. The presentation is easily the game’s best aspect. Although the graphics and sound also never stray too far from familiar territory, the battle and world themes are every bit as catchy as the classics RPG fans grew up on, with music that at times would feel right at home among some of the best the SNES had to offer. The visuals use a finely pixelated style that makes the game look the way you remember your 16-bit games looking, rather than the way they actually look, and there will be moments when most players will appreciate the little details in some environments or the small touches to characters. This reviewer was always particularly pleased with Greig’s loutish victory pose as he throws his head and fists back in visible, albeit silent, thrill. While Kemco largely captured the worst of classic RPG plot and gameplay pitfalls, the team should be recognized for capturing the best of classic RPG graphics and sound. The game's only visual misstep, in fact, is in its use (or unuse) of the system's stereoscopic 3D effects. This functionality is enabled, and should make it easier to distinguish traversable terrain from background, but this is never realized, and instead, simply pushes the character information into the foreground during battles and pushes everything on a regular 2D plane into the background when not engaging enemies, making it an utterly wasted feature. 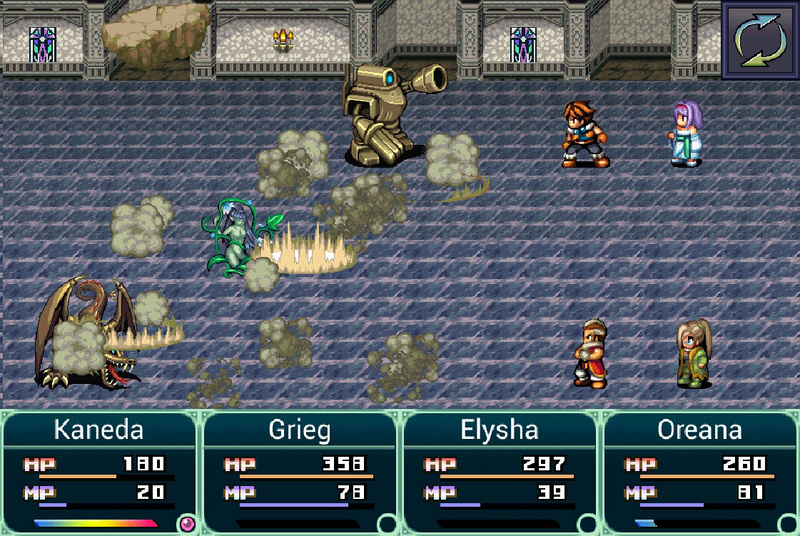 Grinsia is, from surface to core, an old-school JRPG experience that would not have felt out of place in the early ‘90s, although it may have been better received. Ultimately, this is what the game set out to be, and it’s hard to fault a game too much for meeting its own goals. But the truth, unfortunately for Grinsia, is that most gamers will find they would rather revisit a childhood classic, than to play a new game that feels so, so similar to one. Kemco and Nicalis have no doubt seen that the industry has moved on from these games, making them increasingly more intricate, nuanced, and complex, which is why they wanted to return to simpler days. But contrary to Occam’s Razor, simpler isn’t always better. Great review! Too bad the game wasn't as good as Alphadia Genesis or Pier Solar. Anyways thanks for publishing this fantastic article for us. Thanks! Grinsia isn't bad by any means. Just not as quite good as a 2015 RPG should be or quite as good as the ones it's based on. @bro2dragons whoops I forgot to move this out of the draft section. Does anyone know if the game-ending glitch has been patched yet? I disagree this game deserves a 7 or 8 but still I enjoyed reading your detailed review @bro2dragons. Awesome review, but where are the pics? Excellent review I have to say, however that the game isn't that bad of a grindfest. You are one of the best reviewers on this website. What a nicely detailed review!